Earlier this year we awarded a Roger Stott Community Grant to Wensleydale Bike Club to help fund cycling away days in the school holidays. These days aim to help young people to explore the outdoors as well as supporting working families to find positive childcare activities in the holidays. The community grant allows the club to offer trips at an affordable cost of £5 and bikes to lend free of charge. 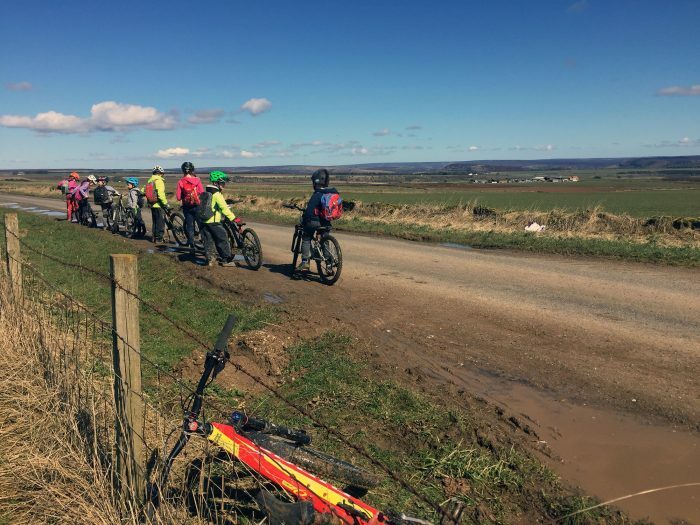 This post, written by Helen Pollard from Wensleydale Bike Club, follows the route young cyclists took on a recent trip to Sutton Bank – and is an ideal ride for adventurous families! Sutton Bank is 15 minutes from the pretty market Town of Thirsk. There are 35km of cycle trails managed by the North York Moors Rangers at Sutton Bank. They are in the main natural trails so offer a cross country experience and are ideal for adventurous families. There is a graded system of trails green, blue and red routes . Green being the least technically demanding and shortest. This post follows our group on the long blue route Drovers which includes a number of steep ascent and descents. This is for the main is a nontechnical route however there are some reasonable long climbs and descents. A shorter loop Fort of 5.5 miles avoids the ascent/descent and is suitable for younger families. For both blue routes it is recommended that children have a reasonable level of fitness, confident on a geared bike and have a level of experience riding on off road conditions. There are no amenities on route so a packed lunch, plenty of water and essential supplies such as a spare inner tube and first aid kit are recommended. The blue starts immediately at the end of the car park and follows a fun little single track through the woods. Here our group stopped to meet Simon the local North York Moors ranger. 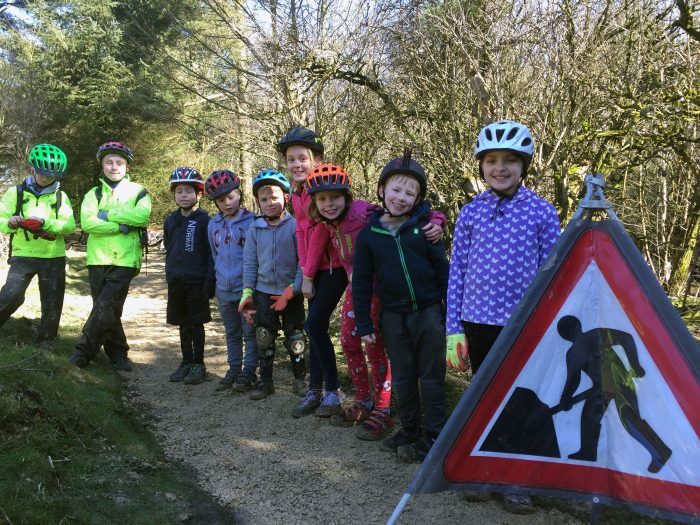 The club had arranged for the children to have a go at maintaining the trail. As part of the Go-MTB award scheme we follow in our club the children are encouraged to develop a sense of responsibility for the environment they ride in. Recognising the requirement to treat the trails with respect by understanding the work needed to preserve them was powerful learning experience for the children. In addition it was great fun, shoveling, borrowing and squashing! After this point you leave the National Park Centre and head out onto the Natural trails and quiet country roads. After travelling across country you reach High Barn we found this to be a good point to stop for lunch. There are some fantastic views to enjoy your sandwiches and the trees create a natural playground for the kids to enjoy. After this point the bridleway descends steeply to the forest fire road. This section if muddy will be challenging for younger or less experienced children and close supervision will be needed. Once at the forest fire road you start to ascend through the forest. There is a mixture of reasonable lengthy climbs and short sharp climbs before you rejoin the bridleway leading back to the centre. Jelly babies may be needed along the way with promises of ice-cream to complete this section without too much moaning! Once you reach the Cliff trail bridle way returning to the centre it is worth noting this is a shared route with walkers. The return route joins the green and red routes and provides a fabulous viewing point and an excellent photo opportunity point at the end of the ride. amenities. At the Bike shop there is a small skills loop which the kids loved and a bike wash (£1 token required). Car Parking Charges apply. Since 2016 the Roger Stott Community Grant scheme has awarded 60 grants worth over £72,500 to help deliver a wide range of exciting projects that make a real difference to the lives of people in rural communities in and around the Yorkshire Dales and Nidderdale. Recent grants have helped fund new play equipment at Gargrave Playground, improvements to facilities at Settle United Junior Football Club, seating at the Langcliffe Community Garden, and training for members of the community befriending service at Embsay & Eastby ‘Good Neighbours’. Applications for the Roger Stott Community Grant scheme open again in October 2018. Find out more here.